t happened every Monday through Friday at pre­cisely 5:00 PM at United’s new terminals at both Chicago’s O’Hare and New York’s Idlewild Airport: Marching in single file to board the rear stairs of the sleek French twinjet SE 210 Caravelle VI-R was a conga line of nattily dressed businessmen carrying leather briefcases and wearing gray flannel suits with white button-down shirts and skinny black ties. It was the beginning of the hip 1960s and the dawning Kennedy era of America’s greatness, and what better way to show the world what this country was all about than having airline service for men only! were an instant success with business clientele. United’s men-only flights continued until January 1970 when the newly formed National Organization for Women (NOW) took legal action, and filed suit to officially end the service. Effectively filling the void in aircraft size at the beginning of the commercial Jet Age, the Caravelle offered short – to medium-range service on routes more suited to the aging propliners remaining in operation, as larger four-engined jets began to com­mand the trunk lines. 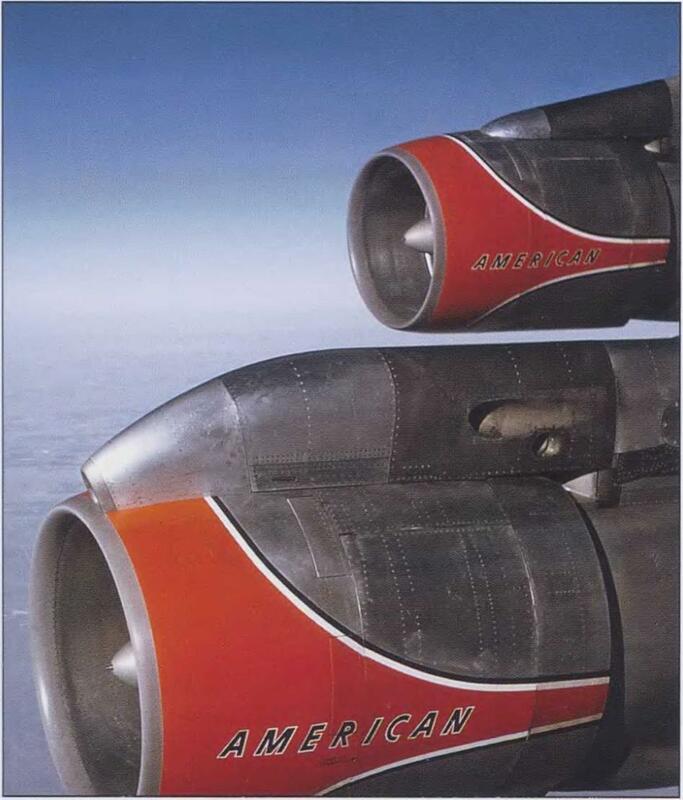 American Airlines, United’s chief competitor, maintained Douglas DC-6B and Lockheed Electra turboprop operations to smaller cities on its route map (the new “CVL” code began to appear on United’s timetables in the column showing aircraft type). Perfectly suited to stage lengths from 800 to 1,200 miles, United’s pure-jet Caravelles soon became a familiar sight in the skies over the eastern half of the United States. In retrospect, history now regards United’s Caravelles with somewhat mixed results after that fleet carried more than 10 million passengers over more than 117 million miles from July 1961 to October 1970. 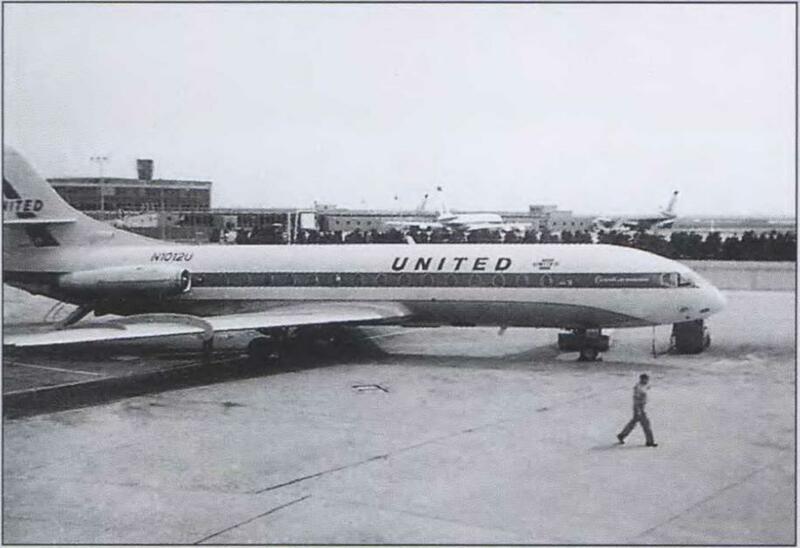 Although passengers favored the diminutive jetliner, the same could not be said for United’s maintenance staff, which had to deal with the aircraft’s cantankerous Rolls-Royce Avon 532R engines surrounded by an all-Pratt & Whitney – powered fleet. From both an operational and training standpoint, having mixed engine types, cockpit logic, and cabin layouts within the same airline always added complexity and cost, but in the Caravelle’s case, the trade-off was that United was able to beat its competition on short – and medium-range routes with pure-jet service until the advent of the Boeing 727 and Douglas DC-9 in the mid-1960s. United announced its groundbreaking $60 mil­lion order for 20 Caravelle VI-Rs in February 1960 as the first foreign-built jet transport ever adopted by a U. S. airline. Ironically, they entered service on July 14, 1961—Bastille Day in France. As so often hap­pens in aviation, history repeated itself; in November 1993 United once again broke ranks and selected the Airbus A320 as its mainstay medium-range jetliner, opening the door to more North American Airbus customers in following years. Once again, an advanced twin-engined jetliner flown by two pilots and built in Toulouse, France, was proudly plying American skies. s good as the new jetliners were for transporting passengers on worldwide routes at 600 mph, these first-generation aircraft gulped copious amounts of fuel and produced noise levels that were almost painful at close range. A further improvement to the turbine pow – erplant ensues with the development of the “fanjet” engine, which not only helps solve the fuel and noise issues, but generates even more thrust than before. The path to full intercontinental jet travel was paved with many small steps. A dream of airline pas­sengers and airline managers alike, round-the-world passenger jet service indeed originated from humble beginnings. Remember Britain’s pioneering Comet 1? That airplane’s first intercontinental route for BOAC in 1952 spanned from London to Johannesburg, connect­ing northern Europe with Southern Africa. As impres­sive as that might have seemed at the time, with the Comet’s modest 1,500-mile range, the trip had to be made in six legs with stops to refuel along the way. By 1954, BOAC’s jet routes extended eastbound all the way to Tokyo, but again that trip had to be flown in 10 segments with the longest single leg from Rome, Italy, to Beirut, Lebanon. aloft were less than optimal. Other foreign carriers used several different long-range Comet 4 models to fly on stage lengths as long as Mexico City to Chicago (Mexicana), Bombay to Bangkok (United Arab Airlines), and Paris to Beirut (Kuwait Airways). With the first Boeing 707-120 and DC-8-30 mod­els, ranges of up to 3,000 and 3,500 statute miles were made possible, respectively. Although a significant improvement over the earlier prototype models they superseded, these gas-guzzling first-generation jets were still restricted to routes where alternate refueling stops were available. Nonstop flights from Europe to the U. S. West Coast or from Tokyo to Honolulu were still only a fantasy in the minds of airline planners every­where. For now, commercial jet aviation had arrived, and flying aboard a jet airliner was as futuristic as it got, but there was one more step to be taken to advance the art and science of jet-powered commercial air travel to its highest level —the truly intercontinental jetliner. were able to pass those cost savings along to their pas­sengers. This factor then drove up demand, and long- range air travel was suddenly becoming more affordable for the casual traveler or family going on vacation. Boeing 707 Intercontinental service was inaugu­rated by Pan Am in July 1959, and within one year, many if not most of the world’s foreign airlines were introducing either the 707-320 or improved DC-8-30 and -40 series into long-range service. While Pan Am could now fly anywhere on its Pacific routes, rival U. S. flag carrier TWA employed its 707-320 series both domestically and across international routes. European carriers such as Lufthansa employed their Rolls- Royce-powered 707-420 Intercontinentals on routes from Germany to the United States, South America, and the Far East. These new long-range versions of the first-generation jets proved to be the answer to many international air­lines’ prayers, but they still operated close to their design limitations as far as engine power and inflight performance were concerned. The longer-range aircraft also consumed copious amounts of fuel as they plied the world’s air routes. Would airframe and power – plant technology and innovation result in even better versions of these new airplanes? The answer to that question came only one year later.